SYNOPSIS - Winter's icy grasp is loosening on the world. The Emerald Queen's vanquished army has its broken back to the Bitter Sea. And treachery is its only recourse. A lackey has declared himself Lord of the defeated, amassing the still fearsome remnants of a ruthless fighting force together for one final assault on a weakened, vulnerable realm. For the warriors who remained steadfast against terrible numbers, for the courageous souls who barely survived a devastating onslaught upon their homeland, the time to rebuilt and renew has not yet come. The war is not over in Midkemia. And Jimmy and Dash - two young noble brothers who stand at the center of a gathering storm - are impelled to action that could secure a tenous peace...or turn triumph into catastrophe. EXCERPT - Four hundred yards up the highway, thousands of men were lined up in ranks, with officers and cavalry mounted to the flanks and rear. More catapults, mangonels, and ballistae were apparent. This was not a defensive position. The army was making ready to attack. Suddenly Erik saw what was about to happen. He glanced at the wall through which he had fought and realized that if it were knocked down from behind it provided a massive bridge over the trenches on either side of the pit. "Back!" shouted Erik, and the order was passed. "Get back and get ready!" shouted Jadow. Erik raced back to where his hors was waiting, and he leapt into the saddle. The sound of horns and the shout of men up the highway told him that at last he was going to join battle in the field with General Fadawah. And Erk's only thought now wasn't on victory, but rather on survival. The battle against the Serpent Queen is over and the demon destroyed, but the war is far from over. The followers of the Serpent Queen have positioned themselves near to Krondor and are determined to capture Krondor. With winter nearly over, prince Patrick has sent Jimmy and Dash to scout the area before reclaiming their kingdom. Meanwhile Erik and his troops are ordered to Yabon and Yilth and before General Fadawah conquers the cities. But even their complex plans are put to shame by the amount of cunning plans the General Fadawah has prepared for them. With the once feared enemy Duko switching sides, the kingdom may yet have a hope. This book explores more of planning and execution and reverse planning than a full fledged war. Meanwhile Pug and Nakor realize that there is more to the war than meets the eye. An evil presence had made himself known and now the Gods are pulling their strings to balance the outcome. Absolutely brilliant war planning. The war strategies and the plannings make this book a wonderful read. Heartbreaks and another important death in the plot calls for an even greater need to vanquish the enemy. And when two brothers give the shock of a lifetime, you'll know that you're blessed to read this saga. 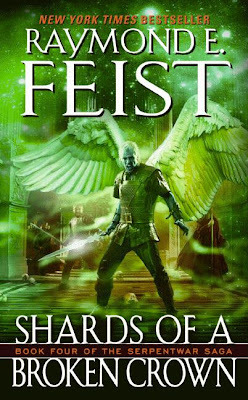 Raymond E. Feist continues the Riftwar Saga into this Serpentwar Saga. The story is finally at an end but the author made sure that another couple of different series can be made from the loop holes that remained and the characters he created. It looks like the end of the journey for Erik and Roo. But I believe, we will see more of Jimmy and Dash and Pug and Nakor in the coming novels. One thing about Raymond E. Feist is that he doesn't try to change his writing from any of his previous works. He writes what he writes best and thus never loses his focus and doesn't make the reader confused. Mr. Feist belongs to the original age of fantasy authors along with Terry Goodkind, Robert Jordan and L.E. Modesitt Jr,. Even though all his books have a similar feel and you might be tempted to stop after a while, his books comprising of more than 5 series all have some connection in between. And when you pick up a new series, it feels you already know a bit of its history.